Well, it's been over a month since I written a post. I don't think I've ever gone this long without writing! The first three weeks since my last post were spent doing the usual that you've heard before if you keep up with our blog ... finishing up our (once again) flooded rental, building our daughter and son-in-law's house, and trying to keep our businesses alive and make a buck in between. Weekends no longer meant a break, and when I did have time to write a post .. I just didn't feel like it. We did manage to take a break with my mom, our daughter, and our son-in-law's family on Mother's Day with a Champagne Jazz Brunch ... the grits covered with crab & corn bisque were my favorite! Our daughter gave me an awesome t-shirt that she designed and made ... I love it! * It's my favorite color (burnt orange) and it's a lady Buddha with two thumbs with "Nirvana" below. Nirvana is the name of our sailboat, and it's a Buddhist term meaning "bliss". It also means to live without ego, envy or materialism ... perfect Mother's Day gift! 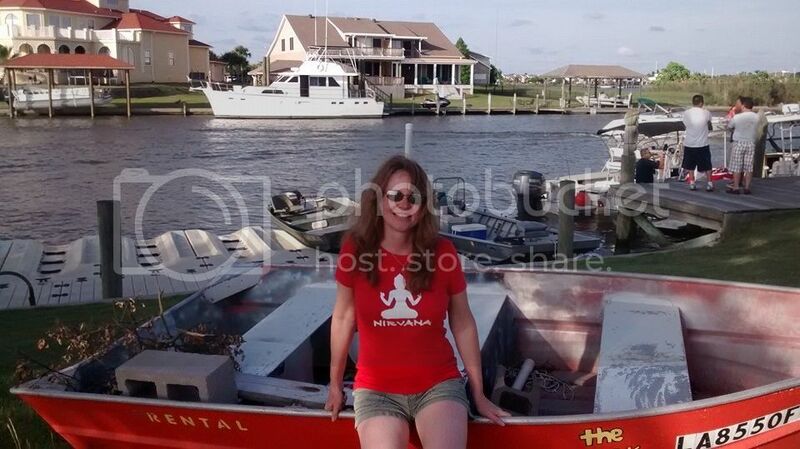 After brunch, I changed into my new t-shirt and we drove over to a local waterfront spot for the afternoon. All at once, we gave up our waterfront home AND moved Nirvana to the boatyard ... we were having water withdrawals! 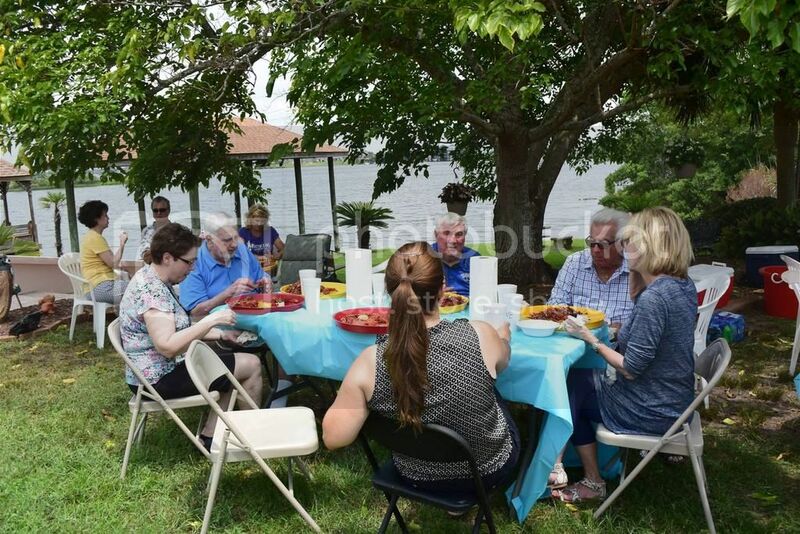 One other day was squeezed in the last weekend in May ... a crawfish boil at my Mom's house. Ken is known as the best boiler, which means he never gets to just show up ... he's gotta cook! Oh well, plenty of beer helped. 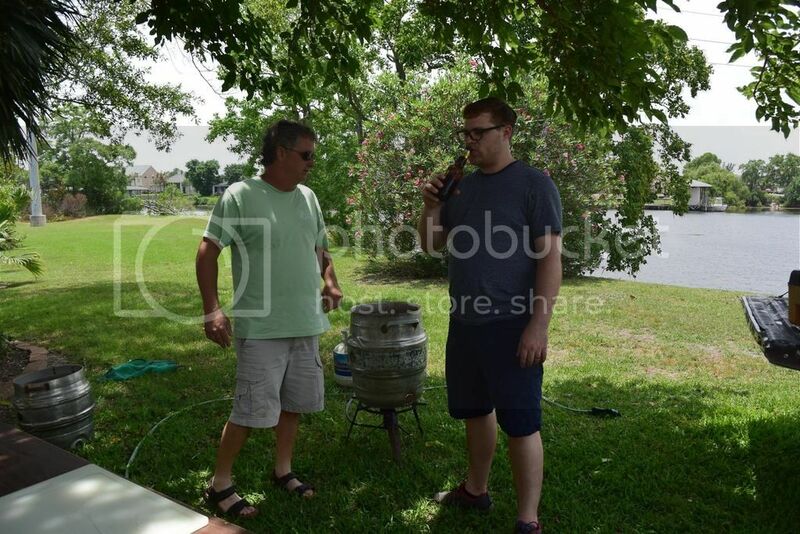 Ken got our son-in-law to help, and he shared a few of his secrets with him for the "perfect boil". We gotta keep good crawfish boils in the family! We don't get to Mom's as often as we'd like, and little did we know that just over a week later she'd be in the hospital. A week ago last night I got a call that she was at the local hospital, but being taken across the lake to another hospital that handles brain injuries. What?! While sitting at the kitchen table with my aunt earlier that day, Mom started to get a bad headache, then neck ache ... when she stood up to go lay down, she collapsed and got sick. Just That Fast! The ambulance came and after doing an MRI it appeared that Mom had blood in her brain. That's when it was decided to move her to the other hospital an hour away. My brother and our family rushed to the hospital and didn't really sleep that night. When Mom woke later the next day, we thought the worst was over and she'd be okay. It's been a long week. Long story short ... the hospital she's in now is one of only two in the state that do angiograms of the brain and deal with this sort of "injury". The good news is they didn't find any clots or anything "bad". The bleeding has seemed to stop on its own and perhaps an aging blood vessel broke? The bad/scary news is that her short-term memory comes and goes and she's very weak. When Ken and I went to see her this past Sunday, we were thrilled to be sitting and talking to the "ole Mom". Imagine my surprise when the following morning I got a call that she was unresponsive! It seems that the blood in her brain can take a week to drain, and in the meantime fluid can build up. Mom had a spinal tap on Monday to drain the fluid and she's again weak and has memory loss. This is all new to us, and we're finding out this set-back is not unusual and could even happen again. If all goes well, Mom will be moved to a physical rehab facility for at least 3 weeks. Needless to say, this past week has been exhausting and I've been on auto-pilot. We're hopeful that Mom won't have any more set-backs and that she'll be in physical rehab soon. More importantly, we're hoping that we'll have our "ole Mom" back. We are searching for the "new and unknown" with our cruising plans ... not this kinda "new and unknown"! It's a scary thing. 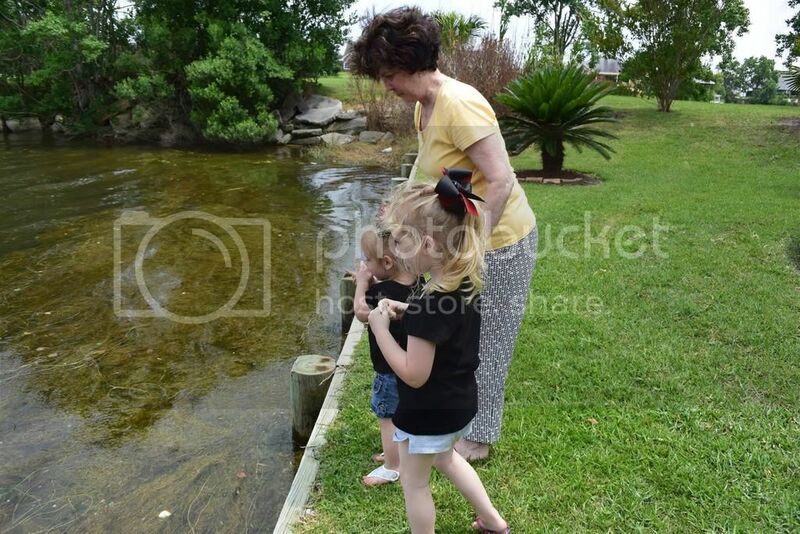 Mom and her two "great-nieces" feeding ducks in her backyard on the day of the crawfish boil. Why finally write a post now?! I guess it's a way to "let it out", and I do love the cruising community that I've become a part of ... even though we're not even cruising just yet! I hope my silence in the past month hasn't caused any of you to get bored with our blog. Your comments and "following" have really meant a lot to us. 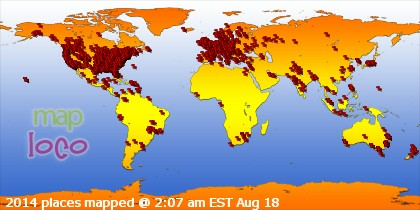 It seems that our "plates" have been full for a long time, but this latest incident has been the most difficult. We're trying to remain positive and take one day at a time. The family is taking turns staying with Mom, and we're trying to allow our step-dad to get some rest. We don't want him in the hospital too! I spent the day with Mom yesterday, and today I must admit ... I'm tired and haven't accomplished anything but this post so far today. I think I'll make myself do a yoga workout and get back on track. Meanwhile, Ken's finished renovating our flooded rental this past Monday and he should have our daughter's house complete within a week ... woo hoo! We're so happy to see the excitement on our daughter and son-in-law's face ... and we're happy to have a paying tenant again! Our 26th wedding anniversary is tomorrow, and we'd originally thought that would be the perfect time to celebrate all these things ... until last week. Maybe we'll still go celebrate ... we still have a lot to be thankful for. 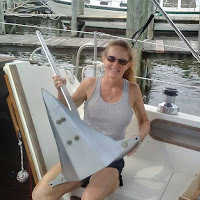 If all goes well with Mom, we should be in the boatyard and working on Nirvana soon. We also booked a trip a few weeks ago to a tropical destination with our daughter and son-in-law later this Summer. More about that later ... we're sure looking forward to some "island therapy"! *Our daugher has started her own business, making personalized items that would be great for the boat! She makes t-shirts, cups, koozies, crawfish trays ... all sorts of stuff that's inexpensive too! She's made some adorable shirts for kids as well. The best part .. you don't have to order a bunch to get it personalized! Check out her Etsy site and her Facebook page! I've already got "Nirvana" cups, koozies and shirts in mind! I've been following your blog and FB page for about a year now and ,nope,not getting bored. hopefully we will see you two on the water soon! In the meantime, blog when you can because we are reading and looking forward to the wonderful things that will be in your future when the timing is right. Julie P.
I was sorry to hear about your mom. Scary stuff, but it sounds like she's in the right place! Here's hoping for a full and speedy recovery of your Mom, As alluring and attractive as the cruising lifestyle is, family still trumps all when it comes to a sense of completeness. Still looking forward to the day you, Ken and Nirvana cast off the dock lines and head out towards the horizon. Burnt orange is one of my favorite colors too! Love the t-shirt - so cute!